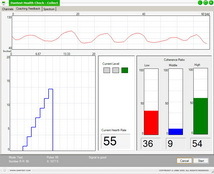 QHRV Stress Assessment is a non-invasive, fully automated computer-based system that provides Heart Rate Variability (HRV), blood pressure analysis and Pulsewave Velocity analysis for quantitative assessment of the Autonomic Nervous System (ANS). 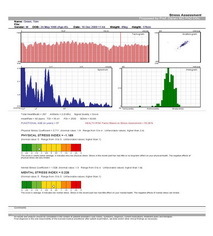 QHRV Stress Assessment offers the possibility of Cumulative Physical and Mental Stress Assessment based on noninvasive HRV Autonomic Nervous System (ANS) Analysis. Overstress and immobilization are conventional health risk factors, triggering the development of life threatening specific diseases. QHRV Stress Assessment Pulsewave velocity analysis is based on physiological phenomenon, observable and measurable in the arterial elasticity and stiffness during blood circulation. QHRV Stress Assessment is the result of more than three decades of very profound scientific research and can be performed easily and in almost all medical branches. 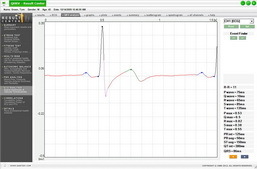 QHRV Stress Assessment consists of two main components: a pulse wave sensor with finger or ear-clip and the accompanying analysis software. The pulse wave sensor measures blood volume pulsations in the earlobe or finger caused by heartbeats. A five-minute recording of the pulse wave is all that is necessary to quickly create an accurate assessment of the status of the sympathetic and parasympathetic branches of the autonomic nervous system. 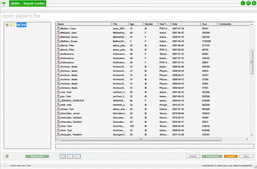 The sensor transmits the collected data to the PC for processing. 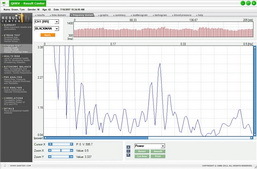 The software uses advanced technology of recording and interpreting pulse wave signals in order to derive heart rate data. 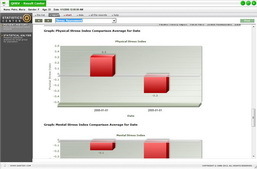 This heart rate data is used to ascertain the current state of inner balance and self-regulatory activity. Easily evaluate overall health condition as well as the effectiveness of selected treatment or other intervention applied. Measurements can be taken before and after any procedure to evaluate the shifts in the autonomic balance and see if a desired effect on the body is achieved and the inner balance is improved. 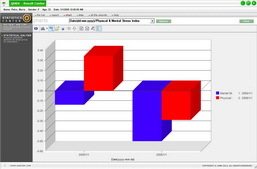 The software and analyses are intuitive, easy-to-use and designed for success in the hands of both medical professionals and non-medical practitioners. 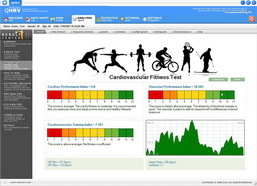 Simple hardware and standard computer requirements ensure QHRV Stress Assessment transitions seamlessly into virtually every health practice including clinics, laboratories, sports clubs and wellness centers. 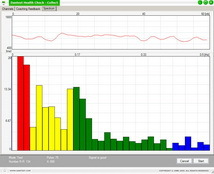 QHRV Stress Assessment is a scientifically valid yet extremely simple-to-use tool designed for measurement of the human body's inner balance and ability for adequate self-regulation. Maintaining this inner balance with ease in the face of the changing external and internal conditions is an important indicator of health, longevity and stress response. QHRV Stress Assessment is easily applicable in the course of mass and periodical medical check-ups. It can also be used for regular health control and for monitoring of the effects of different treatment methods directed toward the general and specific health condition. Consequently, it is useful for the prevention of high-professional and paraprofessional morbidity rates in different categories of workers and employees. QHRV Stress Assessment presents a quick and reliable assessment of basic health risk factors, such as the chronic vegetative disbalance, pathological disorders of the heartbeat activity, the levels of accumulated stress, and the decreased level of physical training. 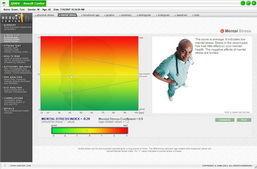 QHRV Stress Assessment offers possibility of Cumulative Physical and Mental Stress Assessment. Overstress and immobilization are conventional health risk factors, triggering the development of life threatening specific diseases. Stress means different things to different people. People recognize stress as a state of having too much expected of them, of being under pressure or strain, or of being barely able to cope with some external demand which is both excessive and prolonged. All of the symptoms carry the connotation of unreasonable demands being placed on the individual in an emotional, mental or psychological sense. A similar concept underlies the term stress in the medical sciences; a force exerted on a subject that, if not resisted, will damage or destroy it. Stressors can be physical, mental or both. Physical stress is caused by long-term exposure to negative factors such as an irregular lifestyle, physical overload, environmental toxicity, cigarette/alcohol/drug use, improper diets, etc. Mental stress can be caused by factors such as insecurity, negative emotions, mental overload, confusion, rejection on a social level, family problems, boredom, low self-esteem, etc. Physical and mental stress each elicits physiological responses that are mediated through the autonomic nervous system. This autonomic nervous system (ANS) is both our major defense against stress and the system that demonstrates the principal symptomatic manifestation of stress in its early stages. The autonomic nervous system is conventionally divided into two parts in a yin/yang balance: the sympathetic, which activates organs, getting them ready to cope with exercise or other physical stress; and the parasympathetic, which controls background "housekeeping" functions in the body. The balance between these two systems is an indicator of the body's reaction to external and internal demands. 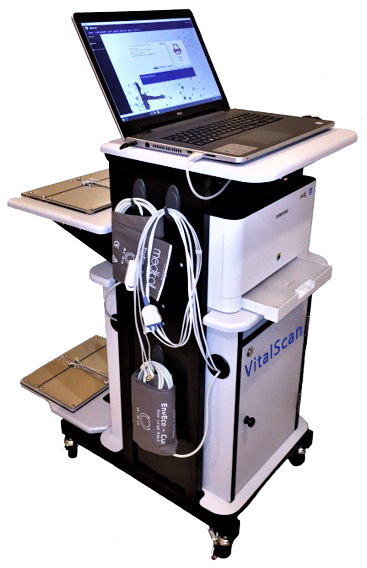 It is widely recognized that Orthostatic testing is one of the most effective methods of measuring subtle changes in cardiovascular function, particularly the system's regulatory mechanisms. When performing the Orthostatic test, the patient sits down for several minutes resting peacefully and then stands up. When the body position shifts from supine or seated to standing, specific changes in heart rate and blood pressure occur as a compensatory reaction of the body. Testing helps to assess the ability of both sympathetic and parasympathetic nervous systems to adequately respond to regulatory challenge caused by gravitational shift in the body's blood mass. The test result (i.e. the orthostatic heart rate) is the difference between the heart rates at supine rest and at standing position. For a healthy individual, standing up as well as maintaining the standing posture for several minutes causes no significant physical exertion. However, if there is subtle cardiovascular deficiency or the functional capacity of the body's regulatory mechanisms is inadequate then this maneuver becomes a significant stressor to the body. 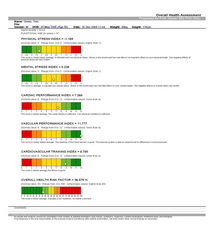 QHRV Stress Assessment Orthostatic testing is the quantitative and qualitative assessment of the fitness and health levels based on HRV analysis. The test is quick and effective and begins with the attachment of simple, noninvasive electrodes, attached as instructed. The candidate is instructed to stand for two minutes followed by sitting for 30 seconds followed by standing for 30 seconds. The full process is repeated alternately for three minutes. 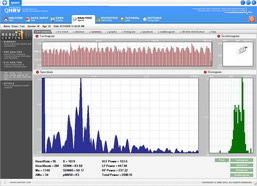 The data collected from mean cardio tachogram and spectrum is analyzed to produce eventual results in both quantitative and qualitative format. 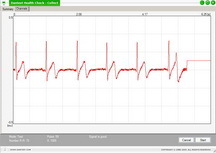 Electrocardiography (ECG) is an interpretation of the electrical activity of the heart over time as collected from a patient during the procedural test. 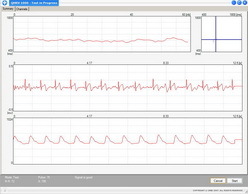 Modern ECG devices use sophisticated techniques like amplification, filtering, and signal analysis to accurately and conveniently measure, display, and analyze ECG data. ECG is the most important test for interpretation of cardiac rhythm, conduction system abnormalities, and for the detection of myocardial ischemia. Arrhythmic cardiac events, which may be extrasystoles (i.e. 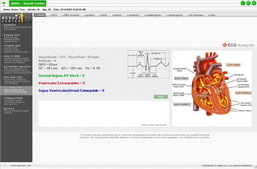 cardiac premature heart beats) are early warning signs for serious potential cardiac issues. The relation between supraventricular or ventricular extrasystoles and health risk is important because they can precede myocardial infarction. They are an early warning signal for possible cardiac problems as myocardial ischaemia ( a decreased oxygen supply to cardiac myofibers or different kinds of cardiomyopathy). Cardiomyopath is a disease or disorder of the heart muscle which can result from numerous conditions including congenital defects, acute or chronic infections, coronary artery disease, drugs and toxins, metabolic disorders, connective tissue disorders, or nutritional deficiencies. Establishing overall health level is key to disease prevention and optimized health. QHRV Stress Assessment presents a systematic and convenient approach to calculating individual overall health. By combining the results of all QHRV Stress Assessment procedural tests including the data collected from Pulse Wave Velocity assessment, ECG analysis, Autonomic Nervous System assessment, cumulative stress testing, fitness testing and correlation analysis a value for overall health is determined. 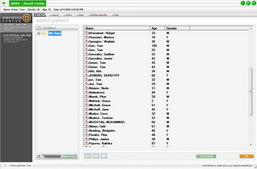 QHRV Stress Assessment analyzes the potential for health problems by examining the body of data generated by thorough testing as compared to a database of over 50,000 test subjects. 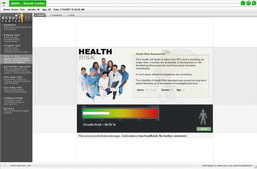 The resulting value is measured in a percentage of overall health risk with 50% relating to 'normal'. A value of over 50% is cause for concern and necessitates medical intervention. The value can be useful in understanding current physical state as well as recognizing resource depletion and reserves available for coping with future ailments. Studies indicate that individuals with increased health risk are more prone to develop illness, including life-threatening disease, within the following few years of assessment. Determining overall health and risk of disease development is, therefore, vitally important to the prevention of serious illness and an important contribution to the wellbeing and longevity of individual life. Patients are able to address their current health issues and manage risks accordingly in order to improve overall health. QHRV Stress Assessment products provide the depth and breadth of information required to make informed decisions regarding therapy, treatment and important lifestyle changes. Products are professional medical solutions suitable for mass testing in a cost-effective manner. The value of QHRV Stress Assessment analyses and health testing cannot be overstated as preventative tools and supplementary guides to overall patient health. Pulse wave is a physiological phenomenon, observable and measurable in the arterial system during blood circulation. During one heart systole a certain blood volume is expelled. This propagates through the arteries due to the reciprocal transformation between kinetic energy of a segment of the expelled blood volume and the potential energy of a stretched segment of the resilient vascular wall. We can observe the changes in pressure, blood flow, velocity and profile throughout the whole pulse wave. 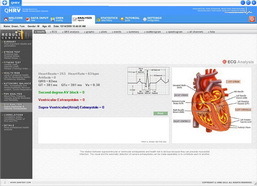 It can be used for classification of the artery elasticity. The condition of the small and large arteries is key to prevention and diagnosis of cardio-vascular related illness. In particular, the stiffness and augmentation of the major arteries is a strong indication of potential health problems including heart attacks, heart failure, sclerosis, and renal complications. PWV Analysis and arterial stiffness indexes (EEI, DDI and DEI) can suggest to healthcare professional to begin appropriate treatment long before the symptoms or clinical signs appear. 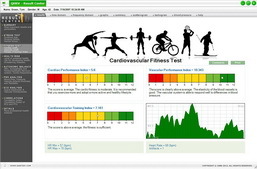 Heart rate variability (HRV) is a measure of variations in the heart rate. 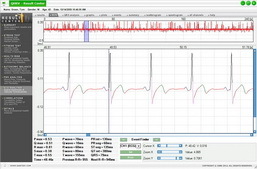 It is usually calculated by analyzing the time series of beat-to-beat intervals from ECG or arterial pressure tracings. 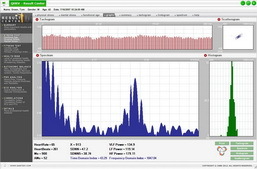 Various measures of heart rate variability have been proposed, which can roughly be subdivided into time domain, frequency domain and non-linear measures. HRV is regarded as an indicator of the activity of autonomic regulation of circulatory function. It also regarded as the definitive method of analyzing the activity of the autonomic nervous system. Alteration (mostly reduction) of HRV has been reported to be associated with various pathologic conditions like hypertension, hemorrhagic shock, and septic shock. It has found its role as a predictor of mortality after an acute myocardial infarction. 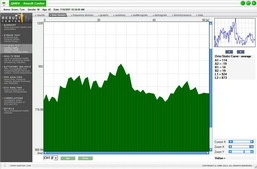 A simple example of a time domain measure is the calculation of the standard deviation of beat-to-beat intervals. 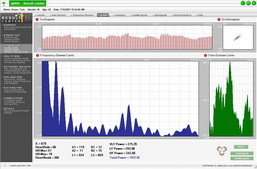 Other time domain measures include root mean square of the differences between heart beats (rMSSD), NN50 or the number of normal to normal complexes that fall within 50 milliseconds, and pNN50 or the percentage of total number beats that fall with 50 milliseconds. SDNN has been strongly corelated to overall variability, while rMSSD relates to the parasympathetic nervous system activity on heart rate. 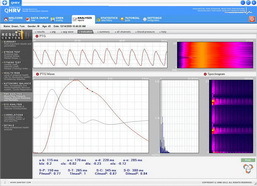 A common frequency domain method is the application of the discrete Fourier transform also known as the Fast Fourier transform, to the beat-to-beat interval time series. That expresses the amount of variation for different frequencies. 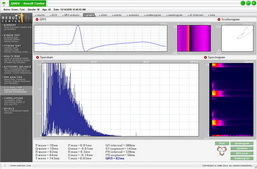 Several frequency bands of interest have been defined in humans. 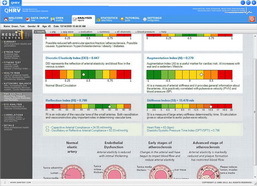 A training system designed to improve health and reduce the impact of stress on the human body through special respiration techniques.